This red fruit salad is full of raspberries, currant berries and pomegranate – perfect for lunch or an afternoon snack! I have finally caved and decided I should get on the healthier-eating train for 2015. I word it “healthier” because I am not quite able to stop myself from the occasional sweet or snack. And I don’t want to beat myself up if I slip and eat a cookie one day. Or a chip. I wish I could say that I woke up one crisp January morning and felt the urge to be a better me in 2015. But that is not at all what happened. I usually over shop when I go for groceries and I have been actively working on this. Last week, I was able to use up just about all of the groceries I had purchased in the beginning of the week, leaving me with saltines and canned tuna by Saturday. No fretting – I planned to go grocery shopping on Sunday. I went about my day, noshing on my salty tuna crackers and then it hit me. A nagging, gnawing feeling in my stomach. I was craving fruits and vegetables. I’ve always believed that if you start craving a food, your body is trying to tell you something. There was a few years span of my late teens/early 20’s that I rarely ate meat. When I got a craving for a cheeseburger, I think my body was saying I needed protein or iron and I would succumb to the cravings for the sake of my body. This fruit and vegetable craving needed to be answered because obviously the saltines and tuna just wasn’t cutting it. Sunday’s grocery trip ended up being a grocery adventure. I went to fruit markets in the Chicago suburbs in addition to one of my usual grocery stores. And it was marvelous. By the time I was finished, my bags were like rainbows. They were filled with deep purple blueberries, bright yellow bell peppers and lots of leafy greens. A lemon or two and a few limes, some carrots and a whole lot of red. Can’t forget about all of the red fruit. 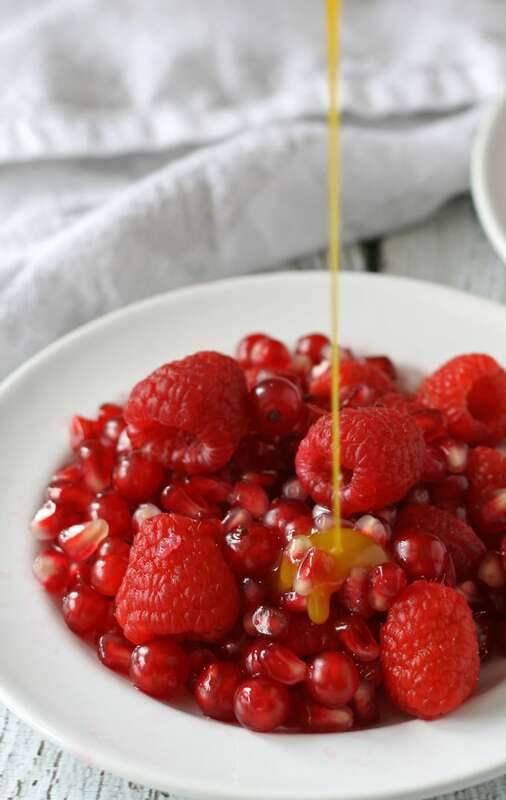 Raspberries, pomegranate seeds and red currant are at the center of this yummy red fruit salad. 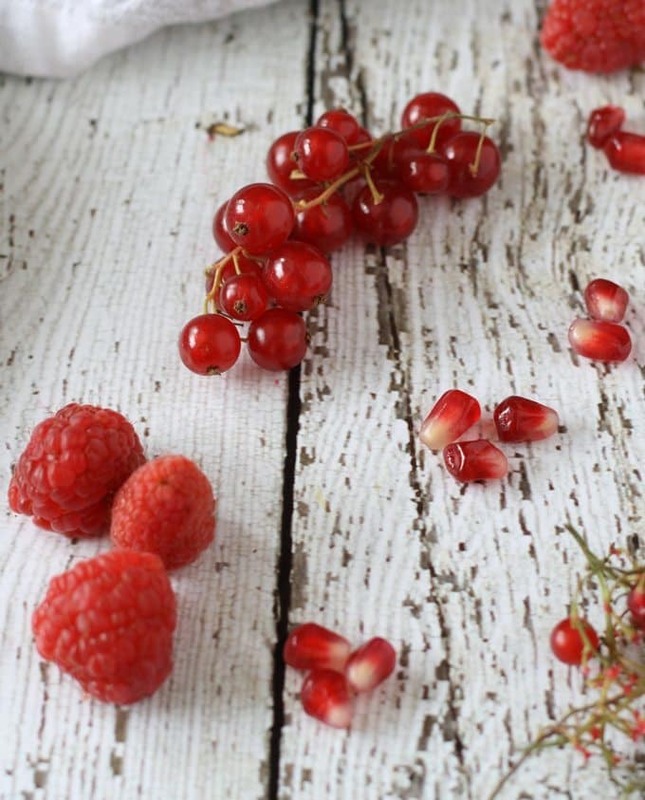 Raspberries and pomegranates are something you’re probably used to seeing, but currants may be new to you. 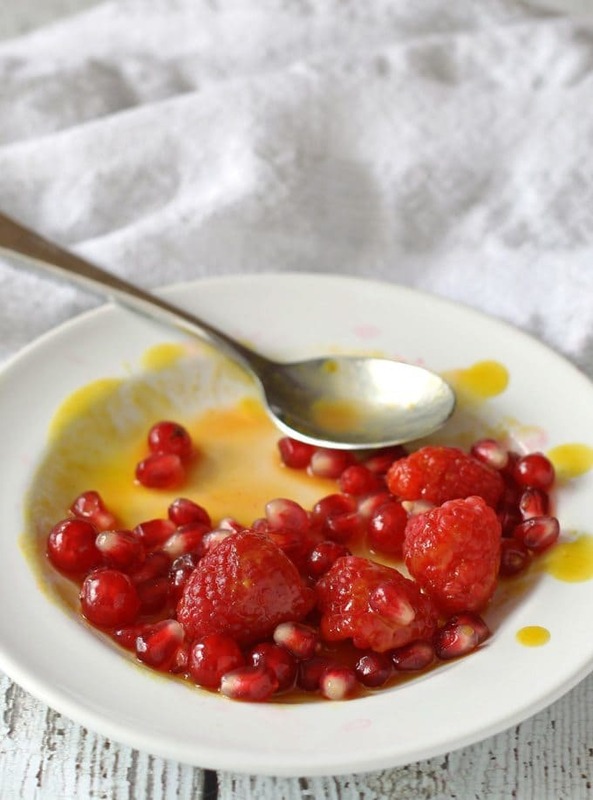 They are similar in taste and texture to pomegranates – a little sweet, a little tart – and delicious! I grew up with them, seeing them in my grandma’s kitchen all of the time. Our Austrian heritage is full of baked goods filled with currant and I recall afternoons where she would make currant jams and jellies. I used to pop them in my mouth, eating them like blueberries. 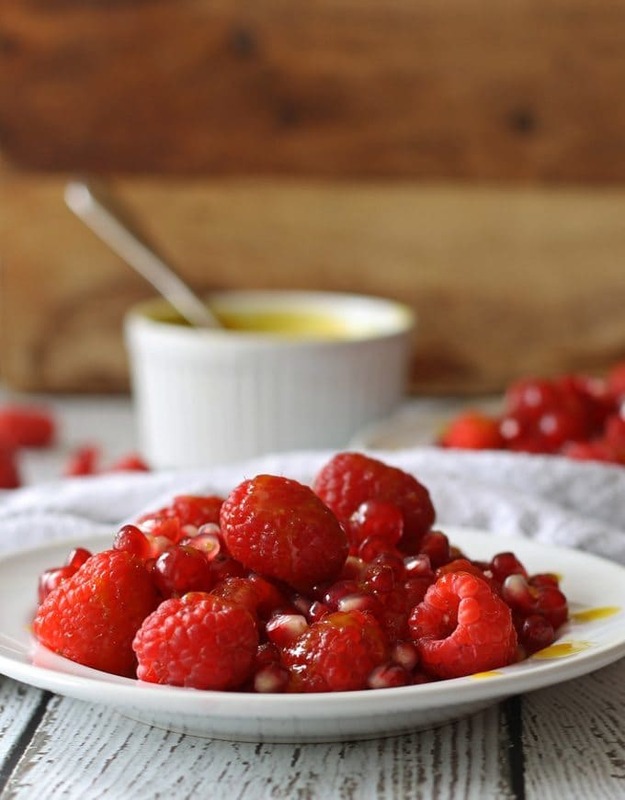 The trio of red fruits is paired with an easy homemade honey mustard. Drizzled over the top, it balances out the flavors of the fruit and makes for a perfect lunch! 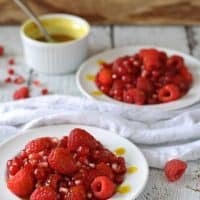 This red fruit salad is full of raspberries, currant berries and pomegranate - perfect for lunch or an afternoon snack! 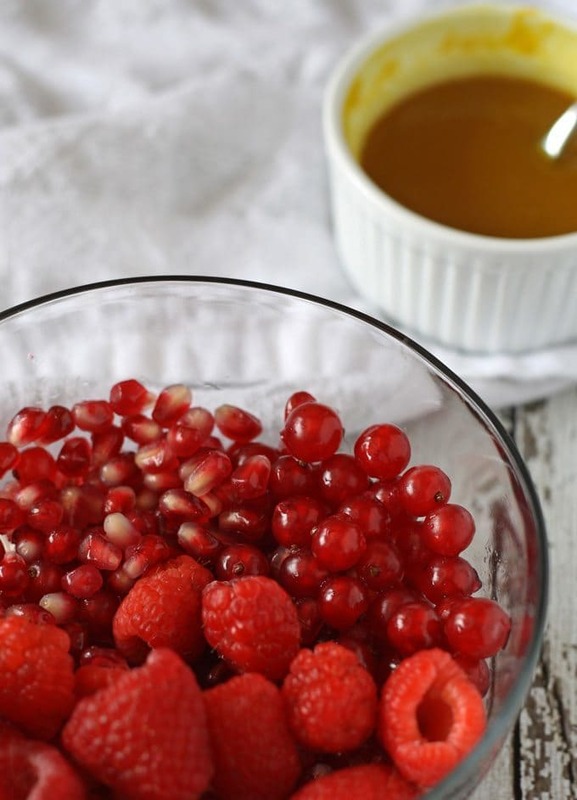 Combine the raspberries, currant berries and pomegranate seeds in a medium bowl. In a small bowl, mix the honey and yellow mustard until well combined. Drizzle over the fruit before serving. I absolutely adore red currants too! I never could afford to buy them when I was a student, but my aunt always had them – so i loved finishing them off when I was there 🙂 I’m going to go on a hunt for them where I live. I know what you mean by cravings… I try to listen to what my body wants, rather than what I want (which is always chocolate). 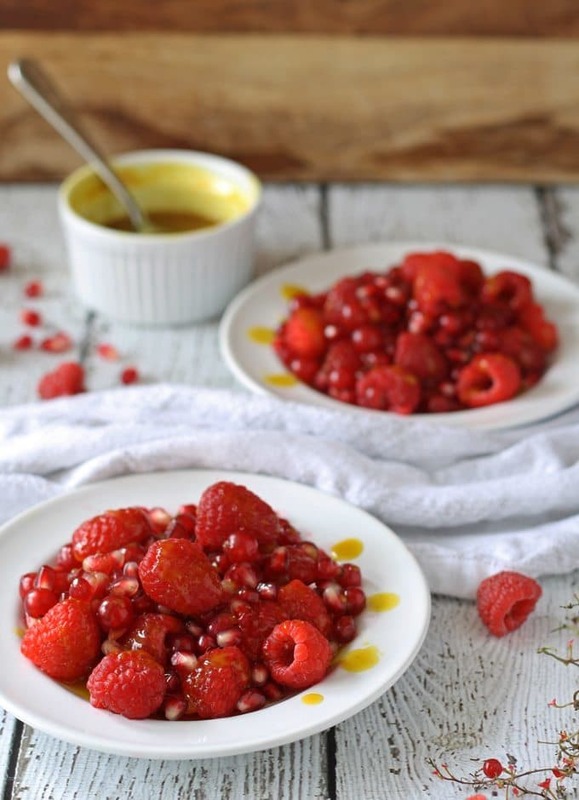 Even if I can’t find red fruits, I want to try the mustard honey dressing – I usually have that on salad. Never tried it with fruit! Yum! Thanks for stopping by Dini – I don’t usually see currant berries at the store, but on my fruit hunt, I saw them twice. It seems they are available right now by me for some reason, so hopefully you can find them too. Honestly, I would have never thought to drizzle honey mustard over the top of fruit with no greens. But why not? I’d certainly eat it with greens. This looks fabulous, Jenny! Thanks Michelle! It is surprisingly good – I think because it’s yellow mustard and not brown or powdered mustard. Oh my…this looks so pretty! I love it! LOVE and I mean LOVE this recipe! This is such a beautiful fruit salad, and of course, it look super delicious, too! Thanks for sharing this beautiful and healthy dish at What’d You Do This Weekend. Your red salad looks so good and so flavorful, I love all those fruits! I love red currants, I love that sharp tart flavor, I need to use those in a salad too sometime! Maria, they have just a touch of sweetness which contrasts perfectly to the tartness. 🙂 I just love them! Thank you for sharing at the Thursday Favorite Things blog hop. Watch for your feature on Monday xo P.S. did you see my new giveaways? Not yet – but I’ll go check them out right now! Thanks for letting me know. What a beautiful color! I might not be able to find currant berries easily in my city though. I hope the salad wouldn’t lose much if made without that ingredient. Would strawberries work? I would substitute with more ponegranate because currant berries are more similar in taste to pom. What a delicious and vibrant salad, it looks lovely. Thanks for linking up to Sweet and Savoury Sunday, stop by and link up again. Have a great day!! Thank you for stopping by and linking with See Ya in the Gumbo. I am intrigued by the honey mustard dressing for this fruit salad (I love honey mustard). Your photos are gorgeous and all the red with different textures is stunning. Beautiful dish! Thank you so much Michelle – it’s really a great salad. Think of when a salad with greens is served with berries and honey mustard dressing and then this makes a little more sense. 🙂 Have a great week! Looks delicious and simple. I’ve never had a full colored salad before, but you can definitely gt creative with it. Thanks for sharing with Turn it Up Tuesday. Thanks April! Glad to share it with y’all and thanks for stopping by! I can’t agree more – when I get a craving, I start thinking about where my body could be deficient. I love that this is all red, too because I’m going to set this up as part of our Valentine’s Day meal plan. Thank you so much for sharing it at the Thank Goodness It’s Thursday party, Jenny! Awesome! I was totally thinking this would be good for V-Day! This looks delicious. 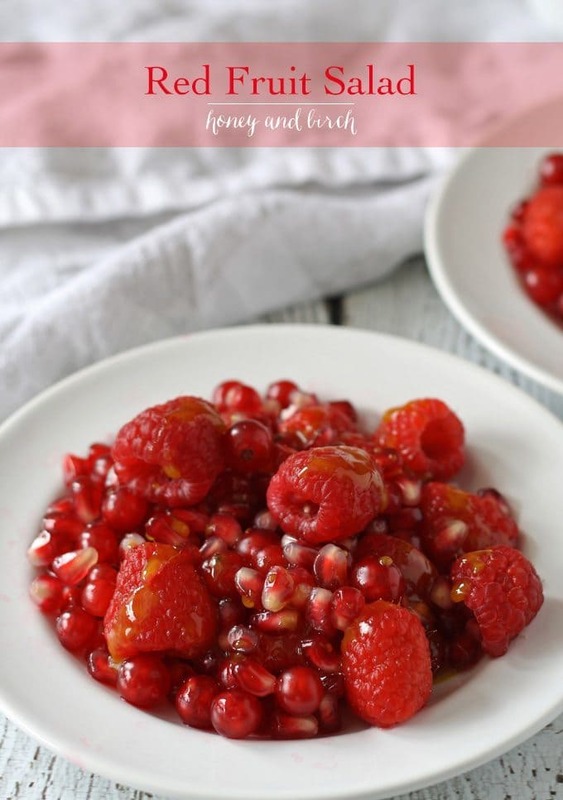 I’m not sure how readily I will find currant berries and pomegranate seeds but I’m willing to look and maybe give this a try…my family would be really impressed if I sat this fruit salad in front of them! Surprisingly, both are available at every grocery store I went to last week. The currant berries were by the raspberries/blueberries/etc so I would check there. You’re right, it’s all about balance. I love how you keep it in perspective.